My finger was bitten by a piranha. OK, here is how it happened. I was fishing in an open boat with some other people on a tributary of the Amazon River in Peru. Our guide in the boat was keeping some of the fish to take home to eat. Yes, people eat piranha, they are very good. We ate some at night at our camp, they were prepared by poaching (steaming). Most of the fish we were catching were piranhas but occasionally some other type would hit the bait. It was easy fishing, just put a small piece of meat on the hook and toss it in. So how did a piranha catch me? The guide was keeping some fish in a bucket and those of us who were fishing would toss one in his bucket if it was a keeper. I caught a nice one (nice?) just as folks were stopping for lunch. But he got off the hook and was flopping around on the floor of the boat. Perhaps I was in too much of a hurry to get a sandwich. I was not careful and reached down to grab the fish to throw him into the bucket and just as I did he flopped up into the air and came down with his mouth right on my finger. I yanked my hand away from him but it was too late. He simply closed his mouth on a chunk of my finger the size of a dime. There was not a first aid kit on board. 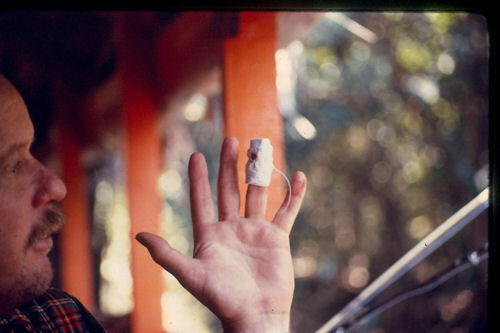 The finger was wrapped with a paper napkin and tied with a piece of monofiliment. The picture was taken while we were on the long boat headed back to camp and it so happened that this was our last day of the trip. We were on a plane early the next morning from Iquitos, Peru to Atlanta with a change in Miami. We got home to Opelika, Alabama late that afternoon. There is a hospital not far from where we lived with a walk-in surgical clinic. I called them and asked if I could come in. I said that I had a problem with my finger. The man suggested that I should wait and come in tomorrow. I told him that my finger was bitten by a piranha. He said "Come on down". A nurse removed the bloody napkin which was still wrapped around the finger and began to wash the hand. I was in a small room away from the other activity. The door kept opening and two or three people at a time would peek in. I guess that the word got around the clinic about the guy who came in with the piranha bite. The surgeon deadened the finger and then cut off the chunk of flesh that was dangling. As he was working, I had to ask him if this was the first piranha bite that he had ever treated. I think he said "yep". There were no stitches. They put a big bulbous glaring bandage on it. The next day I stopped in at my regular bar. The bartender knew that we had been off to spend some time in the Amazon. I did not want to hear him razz me about what happened. So I carefully kept my left hand out of site under the bar and said nothing. He brought over my beer and in his usual loud intensive way asked "What happened Sam, get bit by a piranha? HA, HA, HA".